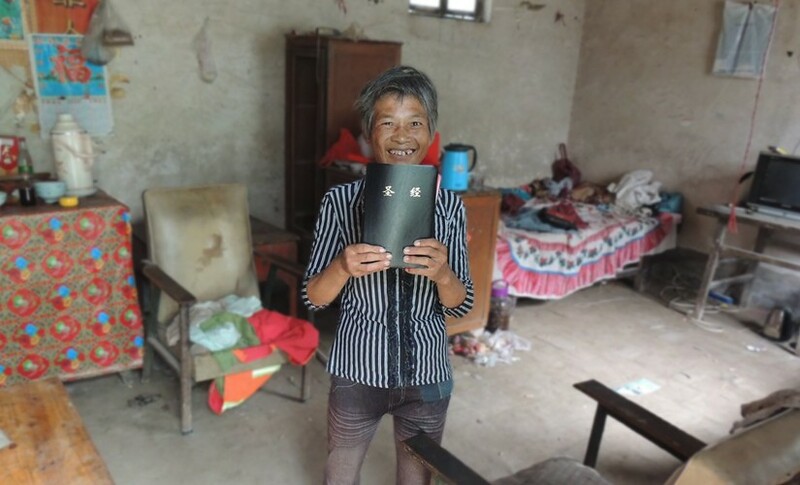 “I read this Bible every day,” says Yu Yan*, who lives in a rural province. She always has a smile on her face, but Yu Yan has lived a difficult life. Born with a joint defect, her feet are turned backward. (And as a result, she’s playfully nicknamed herself “East-West.”) She and her husband earn their living as farmers in a rural province. The harsh conditions and rigors of hard work on the farm caused Yu Yan to develop life-threatening ailments. Thankfully, around the same time, Yu Yan visited a local church and discovered the “Great Physician.” She doesn’t try to explain why or how, but as her faith increased, so did her health and stamina. When her son was 18, a horrific motorcycle accident left him in a coma. Yu Yan and her husband had no money to pay for the hospital stay, so they took their son home and prayed. “God, you gave us this boy,” Yu Yan prayed. “Now he is in trouble. We have no money for him. I give him to you. You decide if he will live or die.” They prayed for several days. Not long after, her son opened his eyes and spoke. Today he is a chef … and a believer. She knows what a luxury it is to even own a Bible. In the late 1940s, some 500,000 Chinese Christians were killed because of their faith. Now, decades later, Christianity is the fastest growing religion in China. Today, Yu Yan proudly shares Scripture with her family. “I read Bible stories, then I tell them at night to my son and husband,” she says. The continued faithfulness of American Bible Society’s financial partners helps us reach out to believers and those throughout China who still don’t know about God’s love. *Name changed to protect identity for safety.